The biceps brachii: A muscle loved by men and women that may be your source for tendonitis at your inner elbow, or for shoulder pain. There it may even mimic shoulder bursitis. If you are a craftsman or an ambitious athlete you may suffer from sore trigger points, or tender areas in this muscle. Of course, others may also tender or trigger points in this muscle. As you can see in the two pictures below, pain that is created by trigger points in your biceps brachii can radiate down into your elbow and into the front of your shoulder. You even might experience a slight pain at the side of your shoulder and/or your upper back. 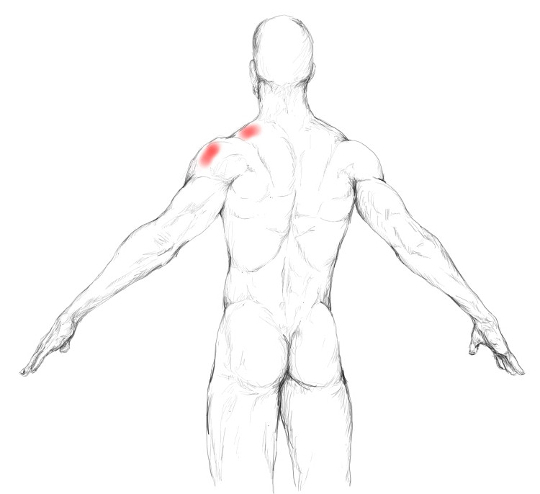 The intensity of the red areas indicates how common pain in the respective zone is experienced when trigger points are present. The darker the red, the more common the pain is. The biceps has two muscle bellies. That is why it is named Biceps. There is a long one, the caput longum and a short one, the caput breve. It has two attachment points at the shoulder, and one at the forearm. In the shoulder, it inserts at the processus coracoideus, the bony knob that you can feel at the front of your shoulder, and on the shoulder blade. At the forearm, it attaches at the upper side of the radius. Note: The processus coracoideus actually also belongs to the scapula/shoulder blade. 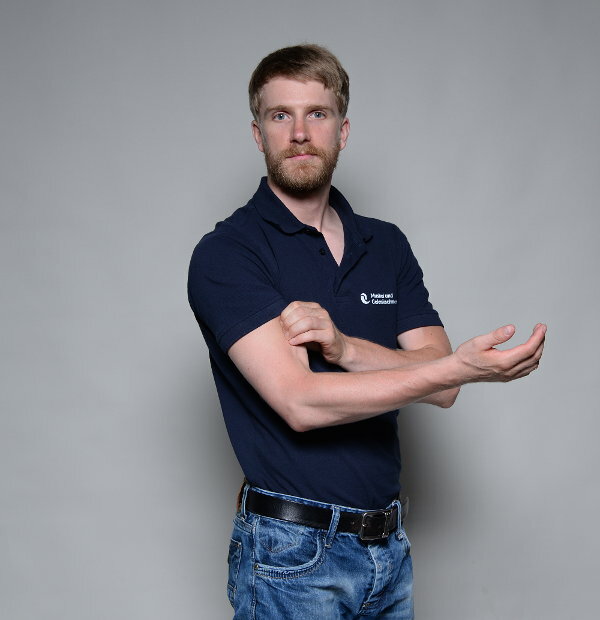 The biceps´ best known function is the flexion of the elbow. When in a flexed position, the biceps brachii also supinates the hand, that is, it turns the palm upwards. 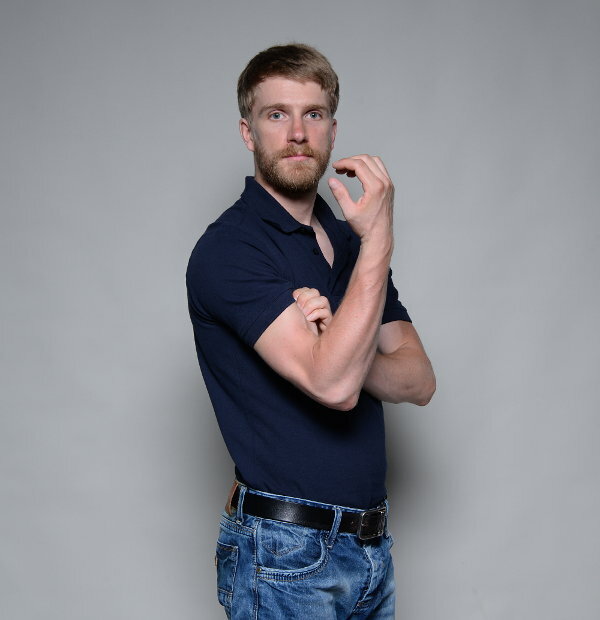 In addition, the short part – caput breve – of the biceps elevates the arm. 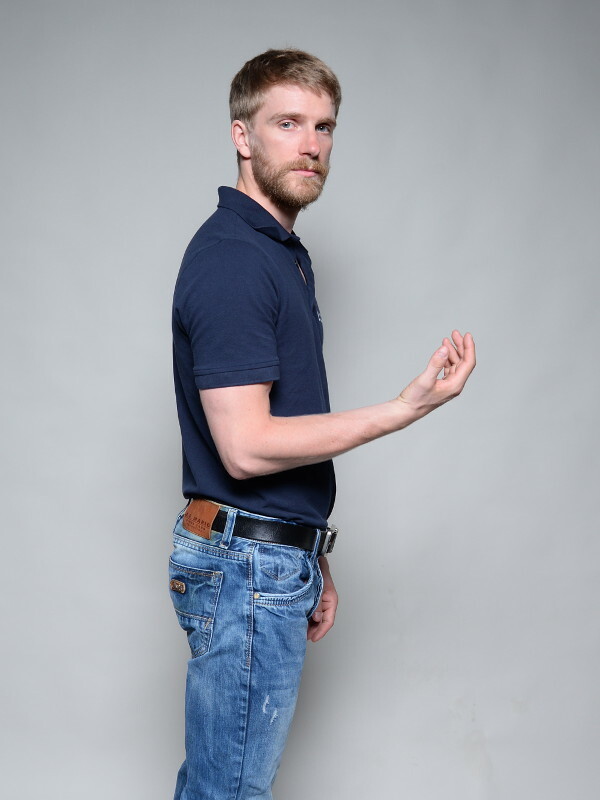 The long part – caput longum – abducts the arm and rotates the shoulder inward. Flexion at the shoulder and anteversion, respectively. 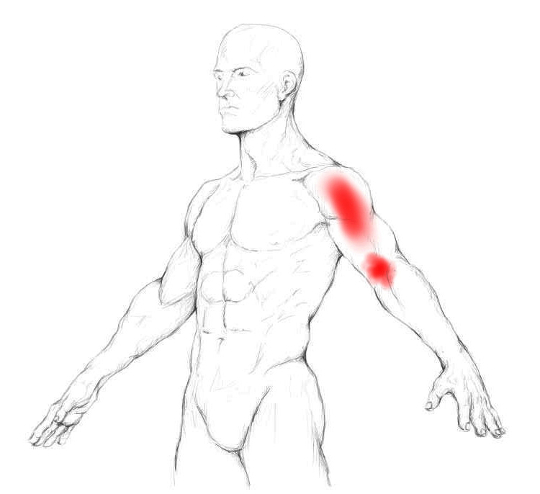 Certain activities and movements may lead to trigger points in the biceps. If you are an athlete, especially a climber, swimmer or someone who exerts heavy throws – e.g. Baseball player –, you need to take care of this muscle. 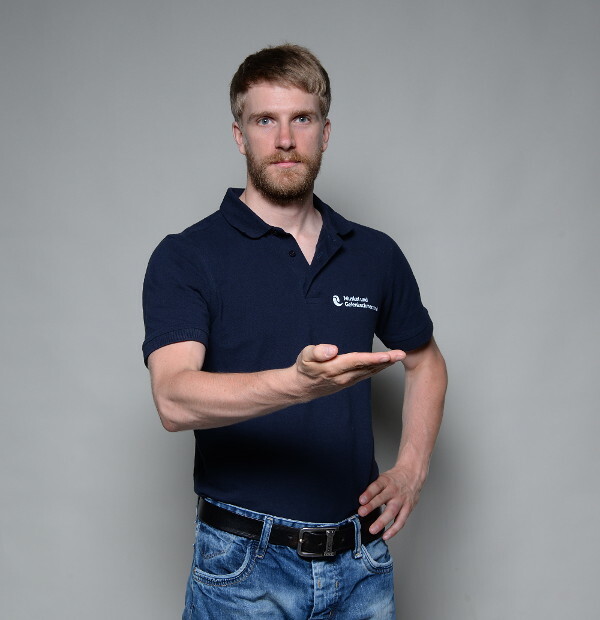 Strong or repetitive supination of the hand, which occurs, for example, when you have to torque a reluctant screw, can cause trouble over time. If you are unused to movements like this, or if you are not in a balanced muscular state, your biceps might cause you problems. Finding this muscle is a no-brainer. Just pinch the muscle at the front of your upper arm and you will have the biceps brachii between your fingers. For massage you can use a ball against a wall. 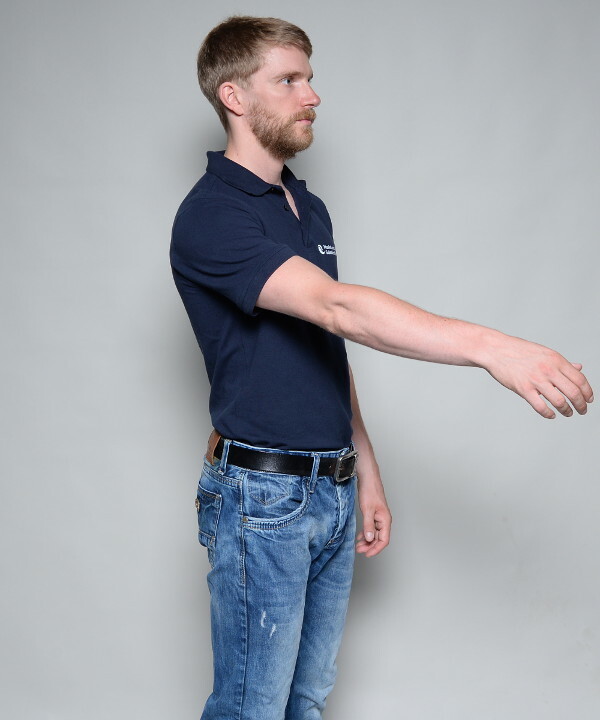 Place the ball on your upper arm, bend your knees and lean against a wall. Roll over the muscle and search for tender muscle tissue. Massage each point with about 15 slow strokes and rolling motions, respectively. Always concentrate on the most painful area, without maximizing the pain. I also recommend to experiment a lot with your massage position.